Mr Mustard expects you remember the article in the Evening Standard about councils in London using signs with which to indicate bay suspensions that were not of an approved design. Barnet Council were one of the culprits. Has that stopped them from issuing parking tickets and raking in the lolly? you bet it hasn't. The Appellant attended in person. The Authority did not attend nor was it represented. The bay was suspended outside 75 to 79 Cxxxxxxx Road. The Appellant said that the vehicle was outside no. 81. The Authority's evidence did not rebut this assertion. There was really no excuse as to why a photograph cold not have been taken of the profile of the whole of the vehicle against the frontages of the properties. The Appellant had also made a challenge to the adequacy of the signage in terms of when it went up. The Authority's assertion that motorists must check every day. Not only is this a little harsh, the PCN was issued at 7:30. 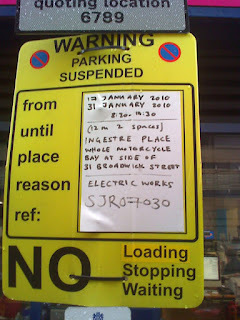 If the sign went up the night before after the vehicle was parked, the PCN is unlikely to be upheld. I am allowing the appeal. In following the Campbell case, I rule that the signage was non compliant as the suspension sign used is not prescribed in the Traffic Signs Regulations & General Directions 2002 and no special authorisation has been obtained. Accordingly, the suspension cannot be enforced. Given that Barnet Council & NSL should both know the law on traffic signs one wonders why they have been refusing challenges based upon inadequate signage. It can't be that they simply want money from you, could it? 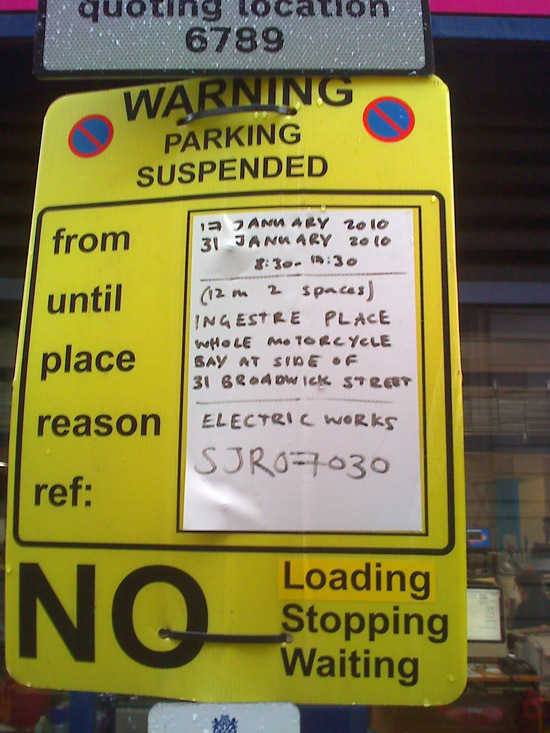 Presumably they have now somewhat belatedly applied for a newly designed sign to be approved but if you have a parking ticket that pre-dates mid February you can get it cancelled. Quote the Campbell case above. If you have paid for such a parking ticket since the Campbell case in January 2010 why not write in to Barnet Council, not NSL, and ask for your money back or email here. When Barnet Council reject any appeal that you have made don't just take their word for it. Barnet Council have a vested interest in rejecting your appeal. Go away and research your circumstances on the internet and send in an informal appeal after you first get the parking ticket, again once you receive the Notice to owner and finally after a Notice of Rejection you can appeal to PATAS where you get an independent consideration of your case. Parking ticket zealots - duty to be fair.